This is probably the easiest way to add smart home technology to your garage. Once you upgrade to a high-tech garage door opener, you’ll never go back. Operate your opener from your smartphone or check on your garage door’s status from anywhere in the world. In addition, you can connect your opener to other systems in your house that control the HVAC, lights, and security. Simply opening your garage door could trigger events like turning on the lights, unlocking the door and adjusting the temperature. Gone is the day when you waste hours of footage on security cameras in your garage. Today’s security systems can be connected to motion sensors, which means you’re only recording when there is activity. These systems will also alert you when the camera is triggered so that you can check immediately what’s going on, no matter where you may be. They are also able to archive much more footage, providing evidence should you need to file an insurance claim or police report. Many people use their garages as additional storage spaces, especially for seasonal outdoor décor and sporting equipment. The problem is, it can often be tough to reach high shelves in your garage, making it difficult to retrieve any items you’ve stored. 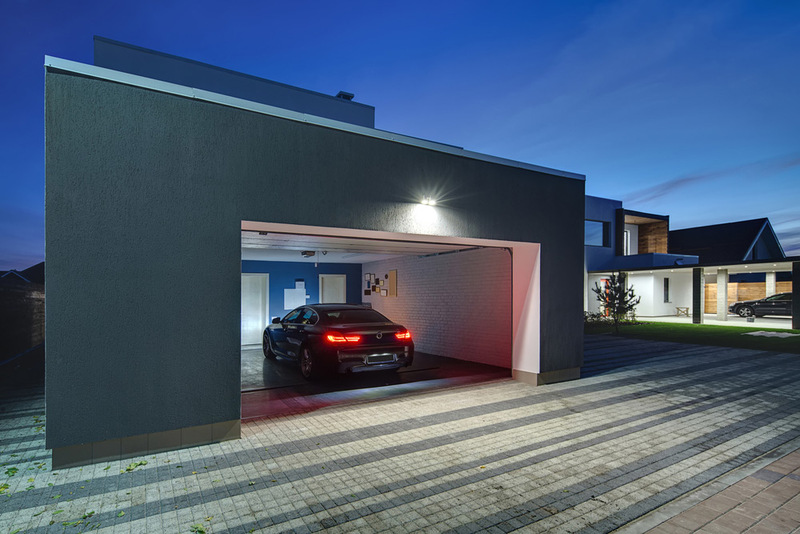 Luckily, many smart garages can now be outfitted with ceiling lifts. These lifts allow you to take advantage of ceiling height to store items while still leaving plenty of room for even tall vehicles. Retractable cabinets descend from the ceiling at the push of a button, making storage a breeze. Although flooding isn’t generally an issue, it can be helpful to install a flood sensor in your garage. Flood sensors keep track of moisture levels and can let you know if you’re having a problem, such as a burst pipe or sewer back-up. This will give you plenty of time to address the issue and move valuables to higher ground. Now that your garage is tricked out, don’t forget about your car. Did you know that there are now devices on the market that connect to your car and offer diagnostics? They capture sensor data and can help you understand why your check engine light just came on or alert your emergency contacts if you’re in an accident. If you’d like more information about buying or selling a luxury home in Laguna Beach, please click here to contact John Stanaland or call 949-689-9047. The Stanaland Team takes great pleasure in helping clients in coastal Orange County achieve their real estate goals and dreams.